The three greatest Canadians of all time are Glenn Gould, Pierre Trudeau, and Dudley Do-Right. A poll of Canadian businessmen in Moscow recently recommended Wayne Gretzky and Bobby Orr to displace the first two. The Canadian Broadcasting Commission nationwide poll of 2004 put Tommy Douglas and Terry Fox at the top. Then too, Gordon Lightfoot (“If You Could Read My Mind”) was at no. 33 and Leonard Cohen (“Bird on the Wire”) at No. 46. 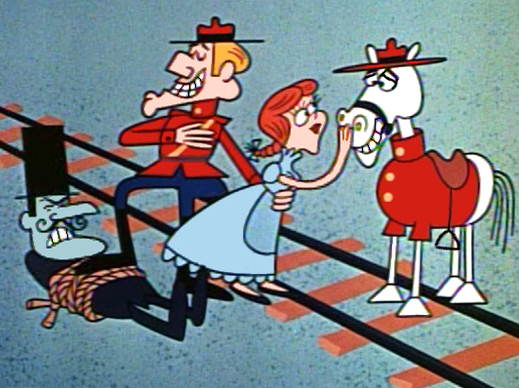 Nobody has ever challenged Dudley Do-Right, who also wins the handsomest Mountie of all time award. Although Dudley stopped appearing in 1970, he keeps getting his man. The tale of Finsky’s plotting in the Canadian goldmining sector has already been told on March 31. A week later, Mikhail Prokhorov joined the plot. Since the start of this month, the Finsky vehicle White Tiger Gold (WTG:CN) has lost 14% of its market capitalization. Yesterday, after Dudley Do-Right made his appearance, the share price fell 5%. That’s value destruction totaling C$51.7 million. And what has Snidely Whiplash been up to? — the takeover by one goldminer he controls White Tiger Gold, of Century Mining (CMM:CN), a second goldminer he also controls. 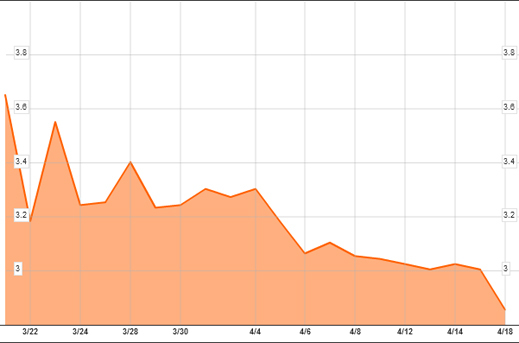 Since March 31, CMM’s share price has fallen by 19%; in yesterday’s trading, it dropped 6%. Value lost, C$39 million over the past six weeks. What happened yesterday was the release of a detailed analysis of the takeover plans of Finsky and several of his Canadian associates by a group of Canadian shareholders in Century Mining. 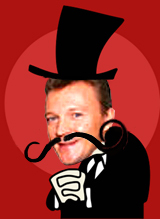 The allegations against Snidely, I mean Finsky, are grave. He and his associates are charged with conflict of interest in misrepresenting the underlying value of the assets in the proposed combination of goldmining assets, and strong-arming Century Mining’s minority shareholders by imposing a break-fee penalty as large as 5% of the company’s market capitalization at the time the White Tiger takeover was announced. As Century Mining’s market capitalization has subsequently dwindled, this C$13.5 million penalty has risen to 8% of the total. Violations of various Canadian exchange rules have also been charged in releases from the group. Here is their analysis. In Moscow Finsky was asked, for the third time, to respond. He declines. Century Mining Corporation Concerned Shareholders Question Business Combination with White Tiger Gold Ltd.
TORONTO, ONTARIO–(Marketwire – April 18, 2011) – In connection with the recently announced proposed business combination (the “Business Combination”) between Century Mining Corporation (“Century”) and White Tiger Gold Ltd. (“White Tiger”), a number of concerned shareholders of Century (the “Concerned Shareholders”) are questioning the soundness of the decision by management of Century to enter into the Business Combination with White Tiger. The parties appear to have moved very swiftly from entering into a letter of intent (the “LOI”) to a binding agreement and it is not clear to what extent Century had sufficient time to perform due diligence with respect to White Tiger. It appears to the Concerned Shareholders that the parties’ rapid signing of the binding arrangement agreement dated effective March 11, 2011 (the “Arrangement Agreement”) and disclosed by Century under its www.SEDAR.com profile on March 14, 2011 was driven by conflicted parties that have a network of insider relationships. Public documents disclose that Kirkland Intertrade Limited (“Kirkland”, controlled by Maxim Finskiy), the controlling shareholder of White Tiger, is also a controlling shareholder of Century together with Gravity Ltd. (“Gravity”, controlled by Fran Scola). Kirkland and Gravity (together, the “Controlling Shareholders”) are described in a press release of Century dated January 4, 2010 as being associates. Pursuant to a shareholders agreement dated December 30, 2009 (the “Shareholders Agreement”) among Kirkland, Gravity and Century, the Controlling Shareholders have the right to place a minority number of their nominees on the Board of Directors of Century. Due to the resignation of the former President & CEO who also served on the Board of Directors, during the time the LOI was entered into, three of the five directors were either conflicted or not “independent” directors, either by virtue of being Controlling Shareholder nominees or by virtue of also being an executive officer of Century – additionally, Daniel Major, a Director and also the President & Chief Executive Officer of Century (and therefore not considered an “independent” Board member under applicable securities laws), is the former Chief Operating Officer and the current non-executive Chairman of Ecometals Limited (“Ecometals”) and has served on its Board of Directors since December 3, 2008 with Fran Scola (who in addition to controlling Gravity, is a shareholder, director and former Chief Executive Officer of Ecometals), Keith Hulley and William Lamarque (all appointees at one time or another of the Controlling Shareholders to the Century Board pursuant to the Shareholders Agreement). The Board of Century, as currently constituted, does not have a majority of directors who are not conflicted or independent of the Business Combination. It is not known if an independent, unconflicted committee of directors of Century reviewed and approved the proposed Business Combination prior to it being executed; the public record of Century discloses only that a “special committee” was struck but does not disclose whether only directors who were independent or not conflicted were named to it. While the special committee retained a financial advisor, according to Century’s publicly released documents the financial advisor appears to have reported to the full Board and not to the independent, unconflicted directors. There is no evidence that such directors met separately from the conflicted members to consider the Business Combination or the report of the financial advisor. Consequently, the Concerned Shareholders believe that the Board of Century may be unduly and disproportionally influenced by the Controlling Shareholders and therefore an unacceptable conflict of interest exists with respect to the Business Combination for which adequate control measures and proper and customary procedures to ensure both the Company and its shareholders were treated fairly may not have been put into place. The Ontario Securities Commission recommends, in situations where there is a potential for an unfair advantage for an interested party as a result of that party’s conflict of interest in connection with a transaction such as the Business Combination, that the negotiations for such transaction be carried out by or reviewed and reported upon by a special committee of disinterested directors. The Concerned Shareholders are of the view that the best interests of Century were not properly taken into account in the determination to enter into the Business Combination agreement since the Board of Directors as a whole is conflicted in this matter for the reasons stated above. Unfavourable Tax Consequences to Canadian Holders of Century Shares. The press release of Century dated March 14, 2011 discloses that the Business Combination will constitute a taxable transaction for Canadian-resident shareholders (and may be a taxable transaction for shareholders residing in other jurisdictions). As the Business Combination is an all-paper deal with the deemed value of the consideration being potentially not representative of the actual value of Century and White Tiger (see below), Century shareholders will be forced to reach into their pockets to pay any tax accruing to them in connection with the exchange of their Century shares for White Tiger shares or be forced to sell some of the White Tiger shares in order to fund the tax payable. As this will affect a sizable number of Century shareholders, the market price and liquidity of the White Tiger shares may be negatively affected. There can be no assurances that Century shareholders will be able to sell their White Tiger shares in sufficient quantities or at a price that will permit them to fund any tax liability. It does not appear that sufficient thought was given to structuring the transaction in a manner that would be more favourable from a tax perspective to the Century shareholders. While the Concerned Shareholders recognize that a break fee is sometimes necessary in transactions such as the Business Combination, the Concerned Shareholders believe that the amount of the fee in respect of the Business Combination is unreasonably high, as it is more than 5% of the market capitalization of Century on March 11, 2011 (the effective date of the Arrangement Agreement). Moreover, it is questionable whether Century even has the cash to fund this break fee, as evidenced by the fact that current management of Century determined it was necessary to take out bridge loans from White Tiger, with a total commitment amount of $4,000,000, at the time it entered into the Arrangement Agreement. It is unclear how the Board of Directors could have determined it was in the best interests of Century to commit to a break fee that the company could not pay, particularly where it was out of the control of Century whether the break fee would become payable – among other conditions, the break fee was payable if the consent of the Deutsche Bank AG, London Branch, an arm’s length third party, to the Business Combination was not obtained within 14 days of the date of the Arrangement Agreement. The Concerned Shareholders believe that the break fee will deter any other bidders from coming forward with a proposal superior to White Tiger’s since the requirement to pay the break fee to White Tiger will make Century far less attractive to such third party bidders. Since there is no disclosure on Century’s public record that the Board conducted an auction or pursued other alternatives to maximize value prior to entering into the binding Arrangement Agreement with White Tiger, the true value of the Century shares to other interested parties may never be known. The Concerned Shareholders believe that agreeing to such an unreasonably high break fee is a clear signal that the parties recognize that only White Tiger and its shareholders will benefit from this transaction, corroborated by the fact that no break fee is payable by White Tiger in the event it terminates the Business Combination. The Business Combination is an all paper deal, with each Century share being exchanged for 0.4 of a White Tiger share (the “Exchange Ratio”). On December 22 and 23, 2010, White Tiger completed the sale of 24,880,210 subscription receipts at price of Cdn$1.00 per subscription receipt (which constitute more than 20% of the currently issued and outstanding White Tiger shares), which were exercised for 24,880,210 shares of White Tiger on December 23, 2010. On December 31, 2010 the shares of White Tiger began trading on the Toronto Stock Exchange (the “TSX”), closing that day at Cdn$1.75. At the close of trading on March 10, 2011, the day immediately prior to the effective date of the Arrangement Agreement, the closing price of White Tiger’s shares was Cdn$4.55. There has been no news publicly released by White Tiger which would appear to account for this 355% increase in the price of White Tiger’s shares since the subscription receipt financing on December 23, 2010, or the 160% increase in the price of White Tiger’s shares since they began trading on the TSX on December 31, 2010. On the trading day immediately prior to the effective date of the Arrangement Agreement, White Tiger’s shares closed on the TSX for Cdn$4.55, effectively valuing the Century shares at Cdn$1.82. However, the closing price of White Tiger’s shares immediately traded lower on announcement of the Business Combination, closing at $3.55 on March 15, 2011 and have since fallen by more than 34%, closing on the TSX at Cdn$3.00 on April 15, 2011. The Exchange Ratio appears to be driven by the trading price of White Tiger’s shares and not from a balance sheet or prospects perspective. As noted above, the Concerned Shareholders believe that there are serious questions in respect of the trading price of White Tiger’s shares. In fact, the joint press release of Century and White Tiger announcing the Business Combination on March 14, 2011 disclosed that the Century special committee believes the trading price of White Tiger’s shares on the TSX many not be indicative of the intrinsic value of such shares. The Concerned Shareholders believe that the failure by the Century Board to negotiate a fair price for the Century shares evidences that the best interests of Century and its stakeholders were not fully taken into account when agreeing to the Exchange Ratio. As noted above, Century and White Tiger have disclosed in the joint press release of March 14, 2011 that the trading price of the White Tiger shares do not represent the intrinsic value of the shares. The Concerned Shareholders believe that the true value of the companies post-merger is the aggregate of the assets of the combined company and that the Exchange Ratio does not reflect that view. A shareholder holding 100,000 shares of Century prior to completion of the Business Combination would see her percentage ownership of the combined entity decline from .023% pre-merger to .0138% post-merger, a reduction of approximately 40% (which percentage reduction applies regardless of the number of shares of Century owned prior to the merger). Consequently, the value of each Century shareholder’s interest in the merged company will be seriously eroded unless White Tiger were to bring assets to the table pursuant to the Business Combination that make up for this devaluation in interest; however, in the view of the Concerned Shareholders there is no evidence on the public record that this will be the case. It appears to the Concerned Shareholders that the combined asset value of the merged company will not be sufficient to adequately support the Century shareholders’ current level of interest.